This week we launched a wellness-inspired jewelry collection with the renowned Hilliard Studio Method (HSM) in Charlotte, North Carolina. Included in the collection are a variety of ebony wrap journal bracelets, our classic gold, rose and silver Count Me Healthy bracelets and custom Love Tag Necklaces featuring words of fitness inspiration. HSM custom necklace styles include their popular “BE POWERFUL” mantra on a 22″ chain and reversible double Love Tags pairing #inspire and #strength tags with mini heart or barbell tags on 18″ chains. Mini tags have HSM stamped on-the-flip. Our necklaces are 14k gold filled over sterling or sterling silver and can be worn on a single chain during exercise. When going out at night, layer your tags with multiple chain lengths for elegant impact with whatever you’re wearing. I’m wearing a reversible barbell and #strength tag along with Hilliard’s mantra BE POWERFUL on Long Bar with a signature heart on-the-flip. Chelsea Charles Jewelry in Hilliard’s beautiful retail space. ​​​​​​​​​​​​​​This partnership is close to my heart because I am such a believer in HSM. It has become a lifestyle. 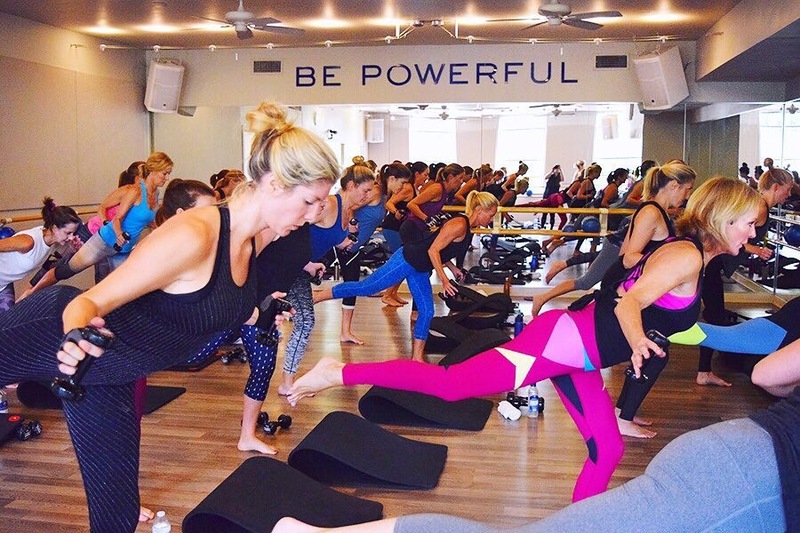 Hilliard studio combines pilates, barre, weights, dance-inspired training and HIIT into one hour-long sweat-fest that will change your body by lengthening primary and accessory muscles. Model Dana wears our black, silver and rose gold wrap journal bracelet now available at Hilliard Studios. ​​​​​​​HSM was created by Liz Hilliard who’s physique and agelessness is aspirational for any woman. With a background in pilates, she and her daughter/business partner, Clary (also a master trainer) have studios around the Carolinas, but anyone can take their classes via video streaming. Their monthly streaming service includes an extensive class library with over 80+ live classes (one new class each week) along with videos organized by duration, area targeted, level of difficulty and equipment (hand weights, bands, playground ball and/or gliding discs). I live stream religiously 3-4 times a week in the morning and pair with cardio. Clary and Liz Hilliard lead a class using 3 lb weights for tricep focus. BE POWERFUL is a great tag line for their unique training method and resides large on a wall of their primary studio. Liz Hilliard demonstrating one of the many plank positions used during HSM’s one-hour classes. At least 15 minutes of each workout are devoted to a planking series. Liz Hilliard of Hilliard Studio Method wears our gold and ebony journal bracelets along with layered Love Tag necklaces featuring #inspire with mini barbell and BE POWERFUL. Prices for the new collection range from $48 for a sterling silver single #strength #gratitude or #pilates Love Tag necklace to $108 for select Count Me Healthy metal bracelets. The Hilliard specific Love Tag necklaces are available in studio and on their website. The bracelets are available in studio as well as chelseacharles.com. Our journal bracelets are inline with the Hilliard Method. Track things like daily glasses of water, fruit and vegetable servings and weekly training sessions.